We clean all types of windows in any size inside and out 365 days a year. First impressions are everything and a book is judged by its cover. 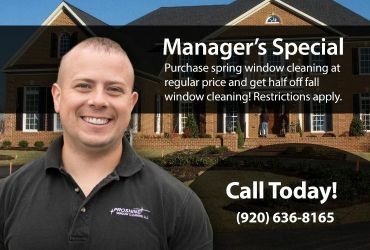 Whether you are having family over or a customer is walking by your storefront, if your windows are dingy and dirty, they won't want to come back or buy from you. Increases the life of the glass by as much as 50% because glass is actually a liquid and not a solid and debris/minerals become a part of the glass and deteriorate it. Proshine brings you fresh chocolate chip cookies with each visit! We pressure wash any type of building, structure, or stone from mid March until mid November. SHOP FLOORS INCLUDING AUTOMOTIVE, INDUSTRIAL, AND HIGH TRAFFIC. Hard deposits and acid in the rain can build up on the exterior of the building and gradually eat away at the material. Regular pressure washing will keep your business in pristine condition or extend the life of your siding by a decade. Get rid of the mildew! Make your concrete look like it was just poured! We will work with you to come up with a regular service plan whether it is weekly, bi-weekly, monthly, annual, etc. We offer discounted packages with regular service and/or doing both window cleaning and pressure washing. Contact us for a custom built package based on your needs!